An Irish Military Seminar is to be held at the Riverbank Arts Centre in Newbridge, County Kildare, on Friday 8th and Saturday 9th June. 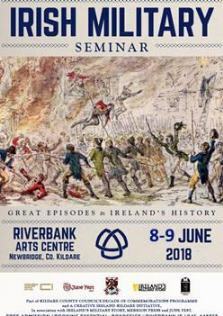 Hosted by Kildare County Council and the Kildare Decade of Commemorations Committee, the seminar will explore many aspects of Irish military history, drawing chiefly on events and personnel from within Ireland but also exploring some escapades in South Africa, Flanders and the USA. Everyone is welcome, but booking is necessary. The Friday evening's activities are free to attend, while the Saturday lecture programme attracts a €5 fee and includes tea/coffee. 8:00pm Who Fears to Speak of '22? The politics of Commemoration. Panel discussion.